When Bryan Cera tells you to talk to the hand, he means it literally. 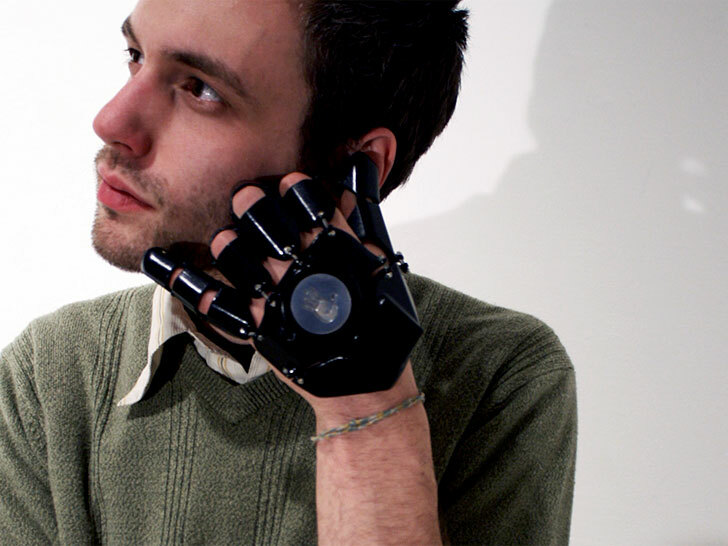 The Milwaukee native is the inventor behind Glove One, a 3D-printed gauntlet that doubles as a working cellphone. The prototype, which debuted at the Peck School of the Arts MA/MFA Thesis Exhibition in April, features touch keys on the underside of each finger, plus a speaker and mic on the thumb and pinkie. More than a newfangled way to mime “call me,” however, Glove One is also a thought experiment, one that explores the sacrifices we’re willing to make to integrate technology into our lives. Glove One, explains Cera, is a “cellphone which, in order to use, one must sacrifice their hand.” It’s at once a manifestation of technology as a phantom limb (per social scientist Sherry Turkle’s) and a statement about the freedoms and restrictions it affords us. Glove One speaks volumes about the lengths we’re willing to go to stay plugged-in. Call it the cyborgfication of society. With technology infiltrating the most fundamental aspects of our lives, including our physical bodies, Cera’s device remarks on our ambivalent reliance on gadgetry. Glove One is impractical—that’s the entire point, but it also speaks volumes about the lengths we’re willing to go to stay plugged-in. When Bryan Cera tells you to talk to the hand, he means it literally. The Milwaukee native is the inventor behind Glove One, a 3D-printed gauntlet that doubles as a working cellphone. The prototype, which debuted at the Peck School of the Arts MA/MFA Thesis Exhibition in April, features touch keys on the underside of each finger, plus a speaker and mic on the thumb and pinkie. More than a newfangled way to mime "call me," however, Glove One is also a thought experiment, one that explores the sacrifices we're willing to make to integrate technology into our lives.